I finished this quick card using the Basket Builder Framelit dies and also used the sentiment from Sealed with Love.The Watermelon Wonder color that I used is a good choice for spring cards, and the flowered paper from the 2015-2017 In Color Designer Series Paper Stack seem to shout "Spring" to me. I wasn't entirely pleased with how plain the card looks, so I pulled out enamels, rhinestones, and pearls. But nothing seemed to make the card "pop". I was about to toss the card as a failure, when I decided to look at items on the Clearance rack, and realized that I had some of last-year's In Color ribbons in my stash -- and these ribbons are on sale at deep discounts on the Stampin' Up! Clearance rack right now. I made a quick bow from the Watermelon Wonder 1" Dotted Trim Lace, popped it on the card and instantly loved the card. I used the egg dies from the Builder Framelits and cut eggs out of both Designer Series Paper and Watermelon Wonder cardstock. You'll want to use the Fine-Tip Glue Pen to attach the eggs. I also used the Delicate Details stamp, one of the free Sale-Bration stamps with a $50 order, to continue the lace theme. What do you think? Get a jump on the Easter-holiday projects. 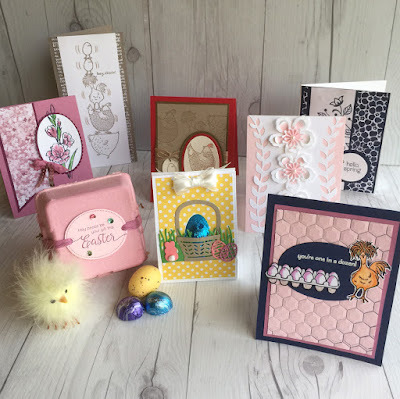 You're invited to this weekend's class where we'll make eight different Easter or Spring cards and treat packages and a 9th project that was a special request. Here's a quick peek at the projects we'll work on. Here's the two treat holders we'll make. We'll color and decorate the mini egg carton, and we'll make the Chocolate egg holder using the Basket Builder Framelits. The Easter sentiment is from the Suite Sentiments stamp set. If you're interested in attending this class. Please sign up on my Meetup site. While signing up for the class, check out the special 9th project only listed on my Meetup Site. Join Stampin' Up! as a demonstrator. A demonstrator can be either a hobby demonstrator to make new friends and enjoy demonstrator product discounts of 20-25% on product purchases. Or you can turn your hobby into a business where you are your own boss, work your own hours, and do something you love! Sign up as a demonstrator for $99 and get $125 in merchandise that YOU select plus an additional 2 free stamp sets. Pick stamps that fit your stamping or scrapbooking style. Your kit also includes business supplies and catalogs. And your starter kit ships free! Have an Occasions catalog order over $99? This is a great way to fill your catalog wish list and get future purchases at demo discount prices. Live events, like OnStage regionals, to see new products, meet new friends, and see old friends. Many demos have been stamping together 5, 10 or 15+ years.